We have listed some of the things you can do on an outdoor vacation adventure in the Maine Highlands when you travel to Dexter near Greenville and stay at The Brewster Inn. Our B&B lodging is convenient to exciting seasonal and year-round activities such as snowmobiling, moose watching, dog sledding, and whitewater rafting near Baxter State Park. My name is Ed Mathieu. 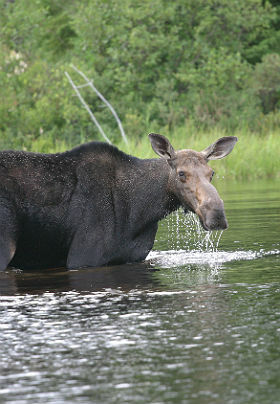 Moose Country Eco Tours has been in existence for almost 20 years. We have been highlighted on national TV in “Postcards from Maine” on the CBS Sunday Morning show, various Boston TV stations, The Learning Channel, and local Maine radio stations. We offer many journeys and adventures that will fulfill and enlighten you! 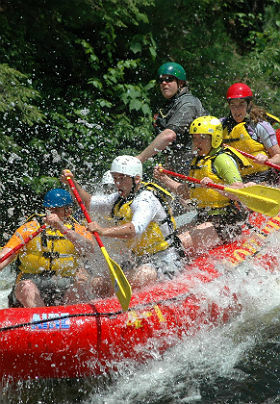 In spring, summer, and fall we conduct various tours by canoe or Jeep Wrangler. Enjoy photographing wildlife while you learn about their biology and behavior. Even learn how the Native Americans utilized everything. We will be among beautiful mountains and remote ponds. We also conduct all-day waterfall tours with lunch, dinner, and drinks, or combo wildlife safari and waterfall tours. In the winter, we conduct snowshoe adventures to lighted igloo-like shelters or portable shelters with heaters. In February, celebrate Valentine’s month as you are served steak, rice, wine, cheese, and crackers by candlelight. In March, we cook Irish stew with Shamrock cookies for St. Patrick’s month. We also offer an all-day trip with a combo snowshoe, snowtube excursion with a trip to Stephen King’s house for a photo opportunity. With Moose Country Eco Tours, it’s fun and adventure all the time! SK Tours of Maine SK-Tours of Maine is the only Stephen King Tour of the Bangor (or Derry as it is known to Steve’s “Constant Readers”) area. This tour started in 1990 in conjunction with Betts Bookstore, which was owned by Stu and Penney Tinker for 20 years, but it has been a full time, year round business since 2008. Most tours are hosted by Stu, but occasionally Penney steps in too. You will find the tours fun and interesting even if you are not a huge fan of Stephen King, as it features quite a bit of Bangor’s history too. Photo ops are numerous, and interaction among the guests is encouraged. Feel free to e-mail SK-Tours@msn.com if you have any questions. Northeast Whitewater is a collection of Registered Maine Guides and ACA Certified Instructors who would love to show you what a Maine vacation has to offer! Northeast Whitewater is located in the heart of the Moosehead Lake Region in Greenville, Maine. We are close to Baxter State Park, Mt. Katahdin, Acadia National Park, and Bar Harbor, Maine. We offer personalized whitewater rafting, kayaking trips & instruction, moose-watching tours, fly fishing, overnight trips, registered Maine guide and swiftwater rescue courses to fulfill all of your outdoor pursuits. Being able to combine our passion for the outdoors and sharing it with others has always been our goal. We love what we do and it shows. Come and experience one of our trips or clinics for yourself. You won’t want your Maine vacation to ever end! You can visit the gym any time of day 24/7 and with unlimited access. Here you will find an array of spa services for pampering and relaxation. Song in the Woods – A unique dog sled adventure in Maine. Hello, I am Stephen Madera. My furry friends and I are working together as Song in the Woods to bring you dogsled adventures this winter. For me, this is a dream come true. In 1987, I began working in the wilderness education field. Much of my time has been with Outward Bound Schools in Maine, Canada, Minnesota, and Texas. I am a certified Wilderness First Responder and a Registered Maine Guide. My purpose is to provide you with a fun experience that is safe, courteous, and affordable. I offer unique winter adventures based around day trips and multi-day trips. Though I do offer camping, most of my multi-day trips are designed to prolong the back country feel and allow you to still have most of the comforts of home. On these trips, we will be staying at local sporting camps that are staffed with hospitable owners who enjoy making your trip a memorable vacation. You will be visiting the area of Gulf Hagas and the Roach Ponds just east of Moosehead Lake. My half-day, day, and multi-day back country trips will feature MUSH YOUR OWN TEAM as an exciting option. There is nothing like working with a team, the feel of the sled, and getting in tune with the dogs. One of the main reasons people return to sled with Song in the Woods is the friendliness of the dogs.